dry work only, effective protection against industrial solvents and greases. Greaseless and non-sticky. Economical - over 300 applications per can. Hygienic and simple to use. Washes off easily with water. Helps protect against dermatitis. 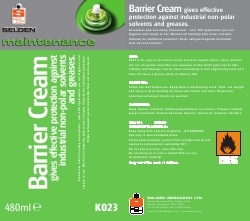 K023 is an easy to use barrier cream to protect against paint, resins, plastics, ink, tar, oil, grease and other non-aqueous media which give rise to skin irritation and damage. Used successfully in fine engineering work as it does not leave a greasy, sticky or slippery film.